Drs. William Halstead and Richard Hall, pioneers in the development of the peripheral nerve block in the late 1800s, are credited with describing the first approach to inferior alveolar nerve blockade (IANB) for dental treatment.1 Their early work formed the basis for much of what is currently regarded as the primary means of providing regional anesthesia of the mandible. While some still refer to the technique as the Halstead IANB, more commonly it is referred to as an IA, IA block, IA nerve block, mandibular block or lower block. As described in the literature, the technique relies on depositing solution close to the IA nerve prior to its entry into the mandibular foramen. Common steps to accomplish this include locating the greatest concavity of the coronoid notch, the internal oblique ridge, and the lateral depression of the pterygomandibular raphe.2–5 By orienting the syringe over the opposite-side premolars at an angle parallel to, and 6 to 10 millimeters above, the mandibular molar occlusal plane, the needle tip is inserted until it contacts bone directly over the nerve as it enters the mandibular foramen.3–5 Despite these generally accepted landmarks, the reported success rate is disappointing, from a low of 19% to 22% in refractory conditions,6,7 such as pulpitis, to 80% to 85% on the high end.2,3,6,7 Repeating the IA block is often no more reliable than the initial injection, after which profound anesthesia may not be achieved. Even well known and highly regarded alternatives — such as the Gow-Gates nerve block (GGNB) — do not have reported success rates of 100%. Modifications and alternatives to the traditional Halstead technique have been discussed in the literature, along with strategies for overcoming failure.2,3,8–12 The large number of alternatives underscores the lack of reliability with Halstead and modified Halstead techniques. When reporting success rates, studies differ significantly — relying heavily on variables, such as clinician experience, anatomic variation and study design. Technique success rates reported in this article represent this varied range of statistics (Table 1). Gow-Gates Nerve Blocks: The GGNB demonstrated an overall success rate of 97.25%, according to a 1981 study by Malamed.13 While that figure is impressive, a 2007 study at Harvard School of Dental Medicine determined that more than half of students educated in the GGNB never used the technique after graduation.14 It is apparent, even among those trained in the technique, that GGNBs are not as widely used as IA blocks. And, as Aggarwal et al15 reported, even after GGNBs, overall success rates drop to 52% when treating teeth with symptoms of irreversible pulpitis. Periodontal Ligament (PDL) Injections: Injection success rates with this approach are often associated with specific therapies, and have been reported as 58% to 100% — with higher success for periodontal treatment and extractions than for endodontic procedures. Although local anesthesia failures can be complex and multifaceted, the majority of IANB failures can be described in two ways. The first occurs whenever there is a lack of profound blockade of the IA nerve following an initial injection. The second arises when accessory innervation provides at least some sensation to mandibular teeth and structures, even though the initial blockade was successful. FIGURE 1. This cutaway view of right mandible exposes interdental and interradicular cancellous bone. Brackets compare the proximity between the molar roots and mandibular canal. If the first situation occurs, the same or another technique must be used to achieve a successful block. If the second situation arises, supplemental techniques to block the accessory innervation will usually result in profound anesthesia. The PDL injection is an excellent single-tooth remedy whenever a nerve block fails to achieve profound anesthesia, regardless of the cause of the failure. When successful single-tooth PDLs are administered, sensory input is prevented.2 Similar to conflicting data with other techniques, success rates reported for single-tooth PDL injections vary from 58% to 100% in the mandible.8,16–19 As with other techniques, PDL injection success is often more profound for periodontal procedures and extractions than in endodontic treatment.7 In addition to its recognized effectiveness for single-tooth anesthesia,2,3,9 some clinicians have found PDL injections administered in the MB, ML, DB and DL aspects of mandibular second molars can contribute to more widespread anesthesia, effectively blocking the IA nerve when anatomy is conducive (e.g., apicies in close proximity to the mandibular canal, Figure 1 and Figure 2).2 This strategy may be referred to as a PDL supplemental rescue injection or as a PDL-inferior alveolar approach (PDL-IA) injection. In both situations, PDL injections must be competently administered, with careful regard for tissue tolerances and fluid pressures. Successful PDL-IAs leverage anatomic features of the mandible when the anesthetic pathway is in close proximity to the mandibular canal. FIGURE 2. 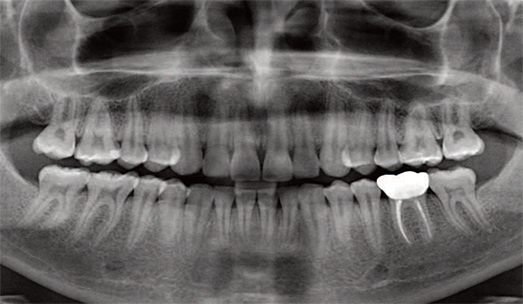 Note the proximity of the second molar apices to the mandibular canal in this panoramic image. Hochman identified three distinct tissue types in the oral cavity and described how their flexibility (compliance) impacts injection rates and pressures.2 Type I low-density tissue is found in buccal mucosa where anesthetic solutions diffuse with minimal pressure. Type II moderate-density tissue is found in less flexible attached gingival and palatal tissues where moderate pressure is required for anesthetic diffusion. Type III high-density tissue is found in the PDL. In contrast to types I and II, Type III tissues are inflexible and require high pressures for anesthetic diffusion. Due to this inflexibility, solution is primarily forced to diffuse through vascular and nutrient canals in socket bone, instead of the PDL. Due to the potential for excessive pressures during deposition, PDL injection rates must be slow. Site selection should include only sites that most easily accommodate flow. Attempts to force solution through the fenestrations in the dental socket into cancellous bone using excessive pressure can be counterproductive. It might be helpful to visualize the bone surrounding tooth roots as a barrier with pinhole openings. When deposition is firm, steady and slow, solution will move through the pinholes rather than build up outside the barrier. If the pressure is too great — and, even more importantly, if not enough time is allowed for diffusion — excess solution can act as a dam, slowing or even preventing diffusion. Another important aspect of reliably successful PDL techniques is to provide pre-anesthesia prior to needle penetration, which is a useful strategy for all intraosseous techniques.2 When patients express discomfort due to inadequate or no pre-anesthesia at penetration sites, clinicians tend to ease up on the pressure and/or withdraw the needle slightly. Both reflexive actions can undermine successful anesthesia. Sufficient pre-anesthesia may be available from an incomplete IA, which, while not profound enough for pulpal anesthesia, may nevertheless be effective in the surrounding gingiva. Testing with a blunt instrument can determine if a PDL can be administered without additional local anesthesia. In addition to using injection techniques, some topical anesthetics, particularly eutectic mixtures for subgingival application, may provide effective pre-anesthesia. Short 27-gauge and extra-short 30-gauge needles are recommended. Once pre-anesthesia is confirmed, insert the needle near the line angles through the sulcus, with the needle shaft toward the apex. Orientation of the bevel is not critical, but orientation toward the root can facilitate movement in an apical direction and gouging is less likely.2,3 Advance the tip of the needle into the PDL between the root surface and alveolar bone. As previously noted, it is important to maintain not only the depth of penetration throughout the injection, but also firm, steady and slow pressure. There is no need to aspirate (the rate of positive aspiration is effectively zero because PDL tissues lack significant vascularity). tomogram cross-section of mandible distal to #31. Note the low density of the bone surrounding the molars and periodontal ligament space; the mandibular canal can be viewed the full length of the section (A). Insertion angle for periodontal ligament injections (B). This low pressure and slow rate result in larger volumes of anesthetic delivered. Additionally, due to the lack of pressures beyond the selected PDL flow rate, pre-anesthesia may not be necessary. of the second molar, as seen here. In lieu of repeated IA block injections, PDL-IAs can be administered to achieve profound IA anesthesia when an IA nerve block has failed. This strategy relies heavily on a clinician’s ability to deliver effective PDL injections. The panoramic radiograph in Figure 2 demonstrates the proximity of the mandibular canal to the apices of the mandibular second molars. 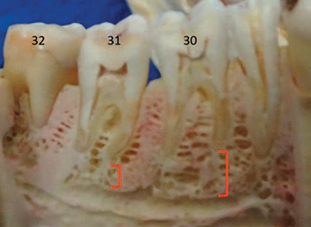 This proximity likely accounts for the clinical observation that supplementing a failed IA block with PDL injections around #18 and #31 can achieve profound anesthesia.2 Figures 3A and 3B and Figure 4 show cross-sections of mandibles, the locations of molars, and the potential bony pathways of anesthetic solution to mandibular canals. Following successful supplemental PDL-IAs, patients frequently touch their lips and chins and say, “It’s really getting numb now.” The subsequent anesthesia that develops in the lip and chin provides verification that profound IA anesthesia has been achieved.2 This approach may be less effective when a significant distance is noted between the apex of the second molar and canal. As a comparison, a greater distance is typically noted between the apices of the first molars and canal. 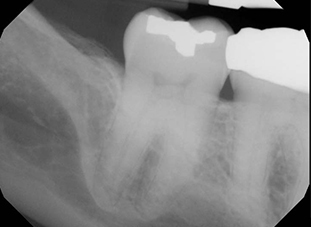 Similar to the Halstead IANB, the single-tooth PDL technique dates back to the first half of the last century. Specialized devices for PDL injections were introduced around the same time.3 With the understanding that IANB failures are relatively common, PDL injections can help overcome failed IA blocks and/or accessory innervation. Two applications of the PDL technique have been presented here. One is well recognized for supplementing failed anesthesia and providing excellent single-tooth anesthesia. The other lesser known strategy can supplement inferior alveolar nerve anesthesia. Adding PDL injections to a clinician’s anesthetic skill set can provide relatively easy solutions to frustrations surrounding inadequate blocks. Lopez-Valverde A, De Vicente J, Cutando A. The surgeons Halstead and Hall, cocaine and the discovery of dental anaesthesia by nerve blocking, Br Dent J. 2011;211:485–487. Bassett KB, DiMarco AC, Naughton DK. Local Anesthesia for Dental Professionals. 2nd ed. Upper Saddle River, NJ. Pearson Prentice Hall: 2014. Malamed SF. Handbook of Local Anesthesia. 6th ed. St. Louis, Mo. Elsevier Mosby: 2013. Evers H, Haegerstam G. Introduction to Dental Local Anesthesia. 2nd ed. Fribourg, Switzerland: Mediaglobe SA; 2003. Manski MC, Cartee DL. Tips for administering inferior alveolar nerve block. Dimensions of Dental Hygiene. 2018:13(11);60–63. Quinn CL. Injection to anesthetize the difficult tooth. J Calif Dent Assoc. 1998;26:665–667. Claffey E, Reader A, Nusstein J, Beck M, Weaver J. Anesthetic efficacy of articaine for inferior alveolar nerve blocks in patients with irreversible pulpitis. J Endod. 2004;30:568–571. Moore PA, Cuddy MA, Cooke MR, Sokolowski CJ. Periodontal ligament and intraosseous anesthetic injection techniques: alternatives to mandibular nerve blocks. J Am Dent Assoc. 2011;142:13S–18S. Jastak JT, Yagiela JA, Donaldson D. Local Anesthesia of the Oral Cavity. 2nd ed. Philadelphia, Pa: WB Saunders Co; 1995. Blanton P, Jeske A. The key to profound local anesthesia: neuroanatomy. J Am Dent Assoc. 2003;134:755–756. Dunbar D, Reader A, Nist R, Beck M, Meyers WJ. Anesthetic efficacy of the intraosseous injection after an inferior alveolar nerve block. J Endod. 1996;22:481–186. Kanaa MD, Whitworth JM, Corbett IP, Meechan JG. Articaine and lidocaine mandibular buccal infiltration anesthesia: a prospective randomized double-blind cross-over study. J Endod. 2006;32:296–298. Malamed SF. The Gow-Gates nerve block. evaluation after 4,275 cases. Oral Surg Oral Med Oral Pathol. 1981;51:463–467. Johnson TM, Badovinac R, Shaefer J. Teaching alternatives to the standard inferior alveolar block in dental education: outcomes in clinical practice. J Dent Educ. 2007;71:1145–1152. Aggarwal V, Singla M, Kabi D. Comparative evaluation of anesthetic efficacy of Gow-Gates mandibular conduction anesthesia, Vazirani-Akinosi technique, plus buccal-plus-lingual infiltrations, and conventional inferior alveolar nerve anesthesia in patients with irreversible pulpitis. Oral Surg Oral Med Oral Pathol Oral Radiol Endod. 2003;109:303–308. Shira RB. The periodontal ligament (PDL) injection: an alternative to inferior alveolar nerve block. Oral Surg Oral Med Oral Pathol. 1982:53:117–121. Hamad SA. Anaesthetic efficacy of periodontal ligament injection of 2% lidocaine with 1:80,000 adrenaline. Al-Rafidain Dent J. 2006;6:26–34. Walton RE, Abbott BJ. 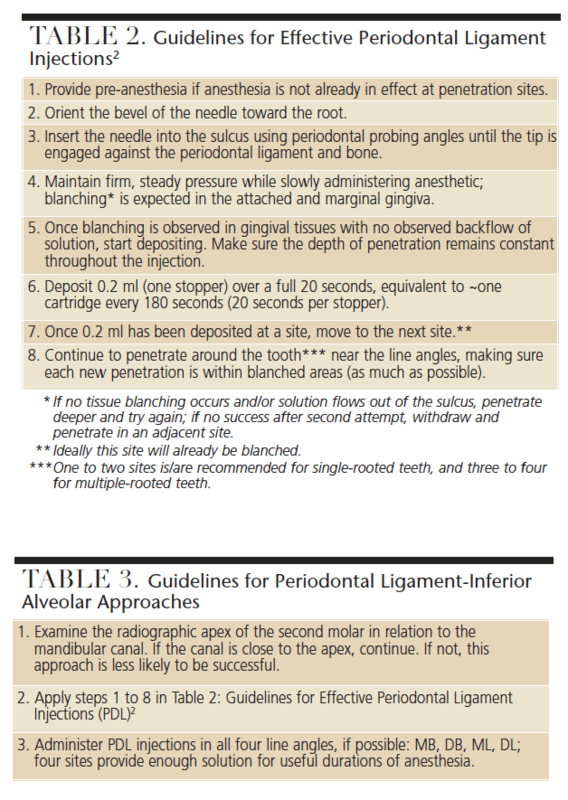 Periodontal ligament injection: a clinical evaluation. J Am Dent Assoc. 1981;103:571–575. Wong JK. Adjuncts to local anesthesia: separating fact from fiction. J Can Dent Assoc. 2001;67:391–397. Ashkenazi M, Blumer S, Eli I. Effect of computerized delivery intraligamental injection in primary molars on their corresponding permanent tooth buds. Int J Paediatr Dent. 2010;20:270–275. Gugliemo A, Reader A, Nist R, Beck M, Weaver J. Anesthetic efficacy and heart rate effects of the supplemental intraosseous injection of 2% mepivacaine with 1:20,000 levonordefrin. Oral Surg Oral Med Oral Pathol Oral Radiol Endod. 1999;87:284–293. Gallatin J, Reader A, Nusstein J, Beck M, Weaver J. A comparison of two intraosseous anesthetic techniques in mandibular posterior teeth. J Am Dent Assoc. 2003;134:1476–1484. Aggarwal V, Singla M, Miglani S, Kohli S, Sharma V, Bhasin SS. Does the volume of supplemental intraligamentary injections affect the anaesthetic success rate after a failed primary inferior alveolar nerve block? A randomized-double blind clinical trial. Int Endod J. 2018;51:5–11. Madan GA, Madan SG, Madan AD. Failure of inferior alveolar nerve block, exploring the alternatives. J Am Dent Assoc. 2002;133:843–846. Brown RD. The failure of local anesthesia in acute inflammation. Some recent concepts. Br Dent J. 1981;151:47–51. Milles M. The missed inferior alveolar block: a new look at an old problem. Anesth Prog. 1984;31:87–90. 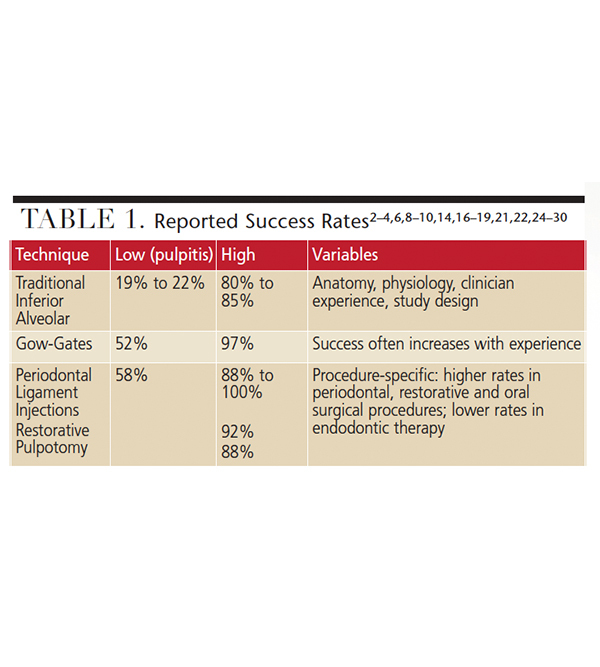 Kaufman E, Weinstein P, Milgrom P. Difficulties in achieving local anesthesia. J Am Dent Assoc. 1984;108:205. 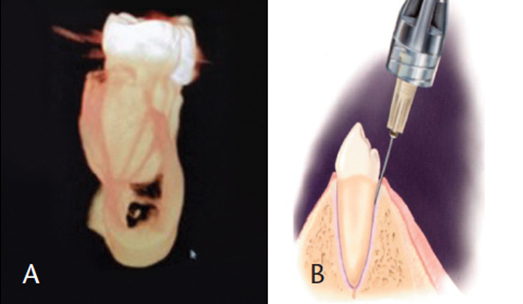 Sabari H, Kumar S, Andrew S, Anandan H. Comparison of anesthetic efficacy of IANB — Classical and Gow-Gates technique during surgical removal of impacted mandibular third molars. Ann Int Med Dent Res. 2018;4:69–72. Haghgoo R, Teleghani F. Comparison of periodontal ligament injection and inferior alveolar nerve block in the treatment of mandibular primary molars: A randomized control trial. J Int Oral Health. 2015;7:11–14. Clark TM, Yagiela JA. Advanced techniques and armamentarium for dental local anesthesia. Dent Clin North Am. 2010;54:757–768. From Decisions in Dentistry. June 2018;4(6):18–20. Arthur C. DiMarco, DMD, is director and an affiliate assistant professor in the Regional Initiatives in Dental Education program at the University of Washington School of Dentistry in Spokane. He is also a professor of dental hygiene at Eastern Washington University in Cheney. DiMarco is a coauthor of the textbook Local Anesthesia for Dental Professionals. He can be reached at adimarco@ewu.edu. Kathy Bassett, RDH, MEd, is a professor of dental hygiene at Pierce College in Lakewood, Washington, and an adjunct professor at University of Washington, School of Dentistry in Seattle. She is a coauthor of Local Anesthesia for Dental Professionals, and has written numerous articles and textbook chapters on local anesthesia. Written for dentists working in general, family and cosmetic dentistry, as well as specialists from all disciplines, Decisions in Dentistry is a peer-reviewed journal designed to support the highest standards of professionalism and integrity in multidisciplinary care. Reflecting the latest thinking from nationally ranked educators, researchers and clinicians, the journal presents evidence-based, clinically relevant articles in an inviting and easy-to-understand format. Unique in its approach, Decisions in Dentistry makes the complex simple and offers unbiased information and continuing education that dentists can use to improve their technique and provide the highest level of care. Subscribe to our mailing list and get exclusive content and updates to your inbox. Decisions in Dentistry Copyright © 2019.